Always the first Friday and Saturday of December. Festivities start Friday at 5:00. For 43 years, Sutter Creek has hosted a magical “Old Fashioned Christmas Open House” for everyone to celebrate and start the Christmas Season. You are invited to enjoy Victorian splendor this Holiday Season and find the spirit of Christmas in this beautiful and quaint little Gold Rush town. 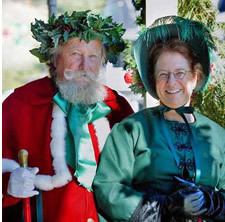 On December 6 & 7, 2019. the streets of historic Sutter Creek come alive with Christmas spirit as they are transformed to an era gone by with Father Christmas, Charles Dickens characters in period costume, strolling along the streets of this magical Gold Rush Town. This is the place to be to spark the holiday spirit with the simple beauty of Christmas and small town charm. To begin the festivities, on Friday Night, at around 6 pm, Santa and Mrs. Claus, led by Star Dancer “Elves”, will come down Main Street to light the community Christmas tree next to City Hall. On Main Street the shopkeepers will be open late to offer a warm and friendly Open House, with snacks, refreshments, and wonderful displays of unique items ready for your Christmas List. Most shops will be open until 9pm so you can really get a jump on your Holiday shopping. For the children, free photos with Santa will be available inside the historic Methodist Church, on Main Street, where Santa will hear their Christmas wishes. Free Arts and Crafts for the children will also be available there. The whole community and beyond is invited to share in the holiday fun on Friday evening from 5 until 9pm. The merriment continues on Saturday with free Horse Drawn Carriage Rides, from 12 – 4pm departing from the Visitor Center at 71A Main Street. Holiday music, wonderful shopping, Father Christmas and Charles Dickens characters strolling down the street will keep the Christmas Spirit alive all day. Saturday evening, at 6 pm is the “Las Posadas Candlelight Walk”. The public is invited to participate in this beautiful reenactment of Joseph and Mary’s journey to Bethlehem. The parade will begin at the Immaculate Conception Catholic Church on Spanish Street where you will be given a candle to hold and light the way. Mary will mount a donkey and she and Joseph will process down beautiful, historic Spanish Street, lined with flickering luminaria. Then on to Main Street, going from Inn to Inn looking for shelter.Carriage ride in Sutter Creek Narrators will retell the familiar story and musicians will lead in singing familiar Christmas carols that everyone is encouraged to join in singing along. This is truly a heart warming experience for all ages. The Las Posadas Candlelight walk will be an evening you will cherish forever. Dress warmly so you can enjoy the entire evening! Sutter Creek, with all of its classic Holiday charm, will rekindle the Spirit of Christmas in your heart. For more information call 209-267-1344. 6:00 Santa arrives on Main Street to Light the Tree. 6:30 – 9:00 Photos with Santa & Crafts for the children at the Methodist Church. Father Christmas and other Dickens Characters will stroll Main Street. Shops open until 9:00. Meet at the Immaculate Conception Church at 6:00pm to join Joseph & Mary as they search for shelter. Sing Christmas Carols as you walk behind them along historic Spanish Street, beautifully lit in luminarias.